May already! I have been attending book signings and seminars, Author Talks and Book Launches, not to mention writing, writing, writing. Nearing the end of the first draft of the sequel (which for now may be known as TK) but feel like I’m still only just starting my journey as an author, as you will no doubt gather from my blog on Goodreads. Last month I was honoured to receive reviews from 5 independent reviewers. And I was over the moon when ALL of them gave me 5 stars. Unbelievable, and so gratifying to know people enjoy my storytelling. You can read the reviews here. 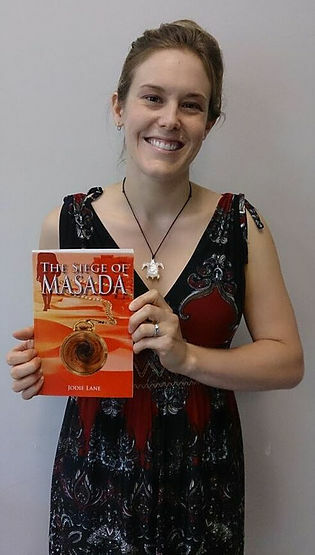 “The Siege of Masada” is available in the following stores: Dymocks Chermside, Dymocks Indooroopilly, Dymocks NorthLakes, Little Gnome (Wynnum), Mad Hatters Bookshop (Manly), Books@Stones (Stones Corner), Mary Ryans Milton, Mary Ryans Noosa, Title (Southbank), Clontarf Beach Post Office and Brighton Pharmacy. The year is well and truly off and rolling. 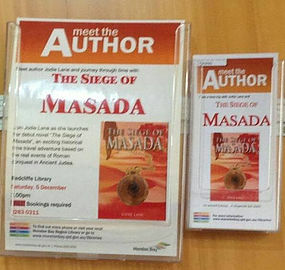 The following stores are now stocking The Siege of Masada: Dymocks Chermside, Dymocks North Lakes, Little Gnome (Wynnum), Mad Hatters Bookshop (Manly), Books@Stones (Stones Corner), Title (Southbank), Clontarf Beach Post Office, Brighton Pharmacy, with copies soon to be in Dymocks Indooroopilly also. My book signing at Books@Stones was a terrific experience – thank you to all who came along and bought a book. If you couldn’t make it, come along to Dymocks Indooroopilly on Sat 16th April, where I will be signing copies all morning. Finally, I’m stoked to announce my short story “The Job” will be published in the anthology Obliquity – launch will be September this year. It has been great working with the North Lakes Writers Group, especially Dee Strange, and I’m very grateful for the opportunity to have my work included. I will be doing a Book Signing at Books@Stones on Saturday 27th February 11am-2pm. 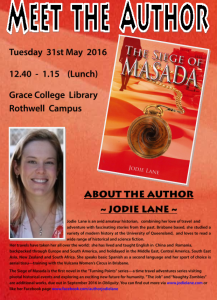 Come on down if you are in the area, even if you already have a copy I’d love to hear what you want to know about the sequel! 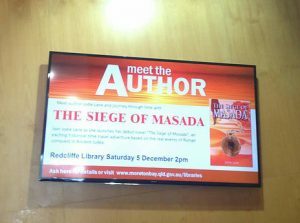 I’m also pleased to announce that “The Siege of Masada” is now in Moreton Bay Boys College, Lourdes Hill College, and as of next week, my old high school St Paul’s at Bald Hills. A New Year and a New Book! For those of you hanging out to know what happens to Gwyn and Michelle next, you’ll be pleased to know the sequel has begun. But in the meantime I need your help to spread the word about “The Siege of Masada” – available now in Moreton Bay, Brisbane and Redlands libraries, as well as Brighton Pharmacy, but signed copies still able to be purchase through the website or through me directly. Tell your friends, your family, write a review onAmazon. 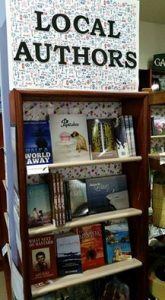 If there is a store you’d like to see it in, please let me know, as I’m currently approaching Dymocks and QBD. I’m also on Goodreads! Please rate or recommend it, as I really want to hear what people think. Hope everyone is off to a great start to the year! What an incredible launch! Thank you so much to everyone who came, we had over 50 attendees, standing room only at the back! 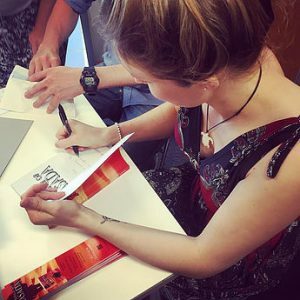 Over 60 copies sold and more Author Talks planned for North Lakes and Caboolture libraries early next year! Check out some of the photos from the event!There is still time to order your copy before Christmas – get in quick and give a time travel adventure gift this festive season! 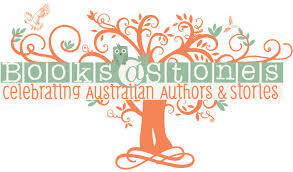 My debut book launch will take place on Saturday 5th December at the Redcliffe Library at 2pm! Check out the Book Launch Facebook Event for updates and details, or go to the Moreton Bay Regional Council Library “Meet the Author”page to book your place. 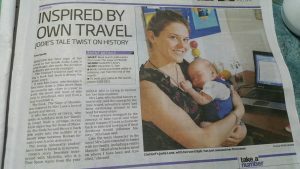 It is a free event, where you can hear about the inspiration behind the novel and pick up your very own signed copy for only $20 (special promotional price), complete with a free bookmark!If you live in Redcliffe, be sure to check out page 61 this week’s Herald (see pic below), which features a story on our release of “The Siege of Masada.” And if you are an international reader, you can order your copy through Amazon and have it shipped directly to you!A big thanks toInHouse Publishing for making this all possible, and may this be the start of many time travel adventures!